At the end of the Inauguration Ceremony for the Agricultural Facilities at Project Wadi Attir, Mayor of Hura and partner in the project, Dr. Mohammed Alnabari, honored Dr. Ben-Eli with honorary citizenship on behalf of the Hura Municipal Council. 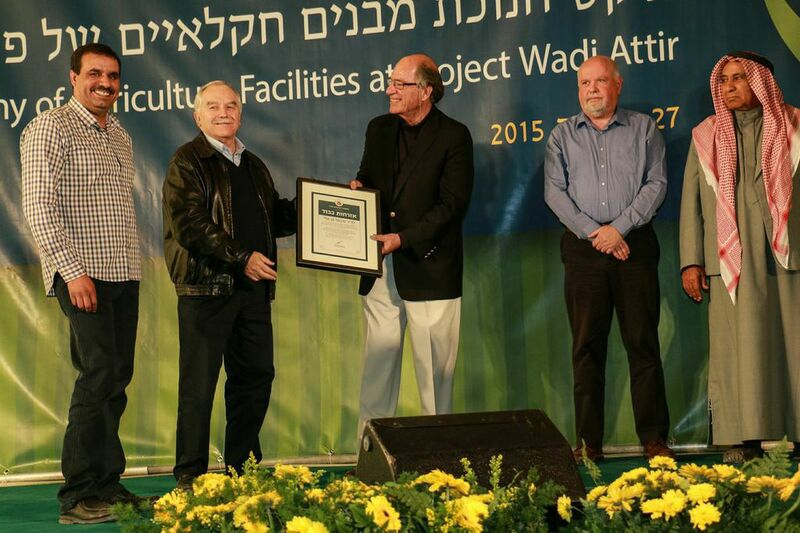 The Hura Municipal Council is proud to grant honorary citizenship to Dr. Michael Ben-Eli for his contribution and original thinking in developing a model for a sustainable desert community, the most significant aspect of which, for us as a community, being the initiative, design, planning, and guidance in the development of Project Wadi Attir. Your modesty and considerate approach exposed all of us to the highest values of giving and work ethic. Your deep belief in the project and your commitment to implementing sustainability principles brought about a true social, environmental, and economic change in Hura and the community at large.